Below are some of the issues you may experience when trying to develop Apache Cordova mobile apps with HTML, CSS & JS for Android, iOS and Windows using Microsoft Visual Studio 2017. For these and other reasons I prefer to keep using Visual Studio 2015, which has none of the mentioned issues. Projects for Windows Store 8.1 and 8.0, and Windows Phone 8.1 and 8.0 are not supported in this release. To maintain these apps, continue to use Visual Studio 2015. This means that UWP 10, provided with VS2017, can only compile apps for Windows 10 and Windows 10 Mobile, but not Windows Phone 8. There are still millions of Windows Phone 8.1 devices in use out there, so keeping good compatibility between them and your app will ensure you get more users. With Visual Studio 2015 and the Windows Phone 8.1 SDK you can compile UWP that are compatible with both Windows Phone 8.1 and Windows 10 Mobile, by selecting the Windows Target Version: Windows 8.1 in the config.xml designer. When using Cordova 6.5.0 and cordova-android 6.3.0, everything will work perfectly. But this version is too old for certain plugins, like the phonegap-plugin-push. When using Cordova 7.1.0 and cordova-android 6.3.0, you can build and deploy to device and emulators, however VS2017 wrongly reports that Deploy failed on the status bar. Nothing serious though, deploy to device, emulators and debug actually work fine. When using cordova-android 6.4.0 or newer, your apps won’t be deployed to device nor emulator. This is because in cordova-android 6.4.0 the APK output path has been unfortunately changed, causing Visual Studio to no longer find the APK and assume the build has failed. My report on this issue has been dismissed as an IDE problem, in other words, Visual Studio should be updated to fix this. You could wait forever until a new toolset is released, so I wouldn’t count on that. Whenever you change the CLI version using the shown select box from the config.xml designer, the setting may be forgotten next time you load the project, because config.xml is not properly updated. Read the next issue for more information on dealing with this error. 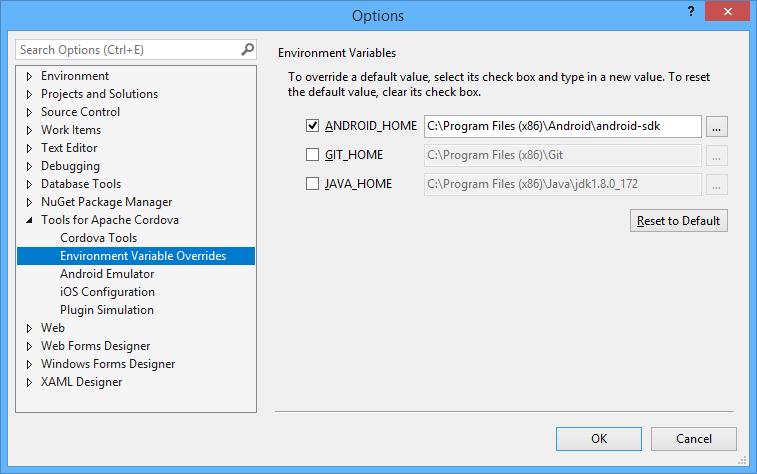 To compile for Android with Cordova 7.1.0, you may need to switch to the Android SDK API 26 by changing the ANDROID_HOME setting from Visual Studio. This introduces the problem that your Android emulators are no longer detected and you cannot deploy to emulator (see detailed issue below this page). By default, Visual Studio 2017 will create new Apache Cordova projects with its own Cordova 6.3.1 toolset. If you change it to use the Globally Installed Cordova version, this setting is forgotten next time you open the project and you are invited to convert the project. And replace it with your globally installed version (7.1.0 in this case). A newer cordova-android version is set as well (6.3.0 is the last version that works on Visual Studio, afterwards the Apache Cordova team kindly broke it by changing the APK output path). Save config.xml and reload the project, your globally installed version will be pre-selected and no conversion will be asked. You can find more details on this issue in this answer I’ve posted on Stackoverflow. 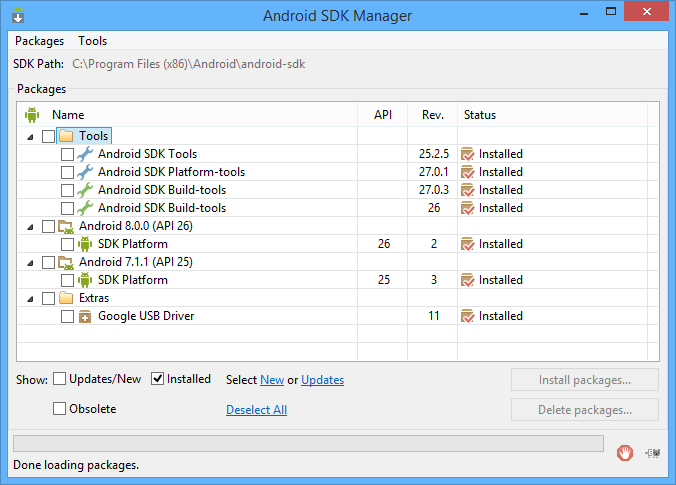 Android SDK Manager for Windows. This SDK manager has been buried in an attempt to get more developers migrating to Android Studio, which features a built-in SDK manager, but you can still get it here. The problem with Android Studio is that its IDE lacks any support whatsoever for Apache Cordova apps, unlike Visual Studio which provides all the tools required to easily create, debug, deploy and distribute them. Whenever you change your ANDROID_HOME path in the Tools for Apache Cordova settings (to compile with a newer Android API) you may notice that Deploy to Emulator option is gone, and replaced with Install Google Android emulators instead. This can be very frustrating. Changing the Visual Studio 2017 Android SDK path here removes the Deploy to Emulator option. Unfortunately, setting your custom ANDROID_HOME to use a newer API will destroy the Deploy to Google Android Emulator option and replace it will Install Google Android Emulators. It seems VS2017 can only deploy to emulatos when using the (increasingly obsolete) Android SDK API 25 provided by the Tools for Apache Cordova from the VS2017 installer itself. How to use my own ANDROID_HOME and deploy to emulator then? How about manually updating the built-in API 25 folder with a newer API? That would be great. However, because the folder structure of the Android SDK API 25 provided by VS2017 installer is very different from the original SDK structure created by the Android SDK Manager, you cannot simply replace the contents of the API 25 folder with those from API 26 to workaround this issue. Trying this will probably result in a non-functional SDK. I haven’t tried VS2017 long enough to locate all its Cordova related issues. If you encounter any other problem feel free to submit it using the Comments form from Disqus on this page. I will try to help you or investigate the issue if I have the time to do so. This entry was posted in Apache Cordova, Visual Studio on May 12, 2018 by Andrés Zsögön.